Favorite part of growing-up in Philly? My favorite part of growing up in the suburbs here: I love the scenic outdoors here. One of my favorite memories is walking the Haverford trails with my parents as a kid. Now I get to enjoy the trails with my husband and children. I was raised in a 2-physician household. My father was an anesthesiologist at Lankenau for 35 years and my mother, a pediatric allergist, took on the role as one of the medical advisors for the School District of Philadelphia. My parents were my role models and inspired me to develop an interest in medicine. When I was a student at Princeton, I majored in history and, for some time, I thought I would pursue a PhD in history. That changed when I interned at CHOP under Dr. Alan Cohen who, along with my parents, inspired me to pursue my original dreams of becoming a doctor. My parents never swayed me either way to pursue a career in medicine, but when I told them I wanted to go to medical school, I knew they were ecstatic! 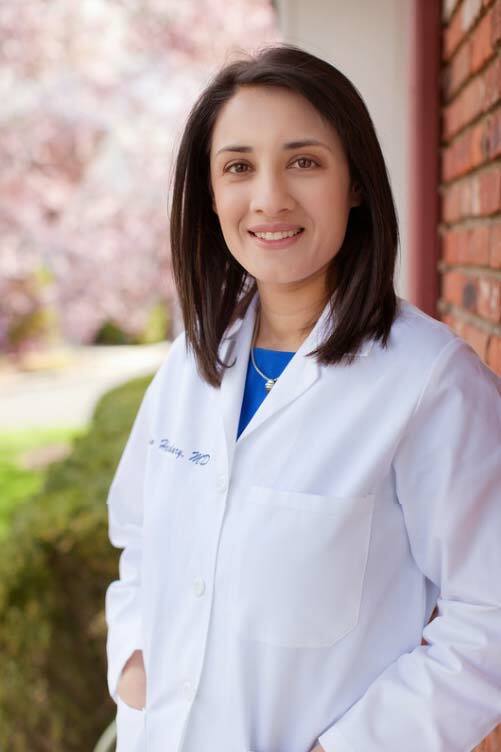 Why did you choose dermatology? I went to medical school thinking I would become a pediatrician like my mother. That changed when I did a rotation in medical school with Dr. Seth Orlow, the esteemed pediatric dermatologist and now chairman of the dermatology department at NYU. I became fascinated with how skin changes can be a clue to underlying systemic diseases and how the burden of skin disease can impact a child or adult’s psyche and self-image. One of the most memorable patients I saw with Dr. Orlow was a 6 year old girl with alopecia universals (she had lost all her hair). She had a twin identical sister with beautiful hair. I will never forget how this little girl’s disease had impacted her confidence and well-being. You studied at NYU, how was that experience? I loved being at NYU for medical school. After living essentially in a bubble during my undergraduate life, it was so exciting to be in a big city and explore it as a student. The experiences I gained at Bellevue Hospital in NYC served me well as a medical student, doctor and human being. There were people from all walks of life, from all ethnicities, religions, and countries. I will forever cherish the opportunity to take care of such a diverse group of people. What excites me the most about working at Cirillo Institute is having wonderful colleagues. When I had my own practice in Livingston, NJ, I was essentially working as a solo practitioner. It is exciting to be a part of a group of well-respected physicians—we discuss patient cases with each other, bounce ideas off of each other, and have developed a camaraderie with each other. I also love being back home where I was raised and taking care of patients and their families from my childhood neighborhoods. There is something so memorable about being a part of Main Line Health, a health system to which my father also belonged. I love interior decorating. I’m not claiming to be good at it, but I love picking vintage pieces of furniture or decor and creating a unique space.